J. A. Henckels is one of the top manufacturers of high-end German kitchen knives. Its history of excellence stretches back literally hundreds of years, meaning you can find multiple generations of chefs who have enjoyed their fine Henckels knives in the kitchen. Today, they make two styles of knives: a more mass-market variety under the normal J. A. Henckels name, and a collection of ultra high-quality forged knives under the Zwilling J. A. Henckels imprint. This tells us two things when it comes to Zwilling cookware: first, it’s supposed to be high quality. If Henckels was interested in making cheap aluminum cookware, it could easily do so under the regular J. A. Henckels brand without losing out on market appeal. Its choice to make this cookware under the Zwilling label means that it’s designed to cater to a crowd of discerning chefs who expect the very best. Second, it means that Henckels has something to lose. Henckels normally reserves the Zwilling name for premium top-shelf products. If low-quality cookware is produced under the Zwilling name then Henckels has effectively lowered the value of their own brand by associating their imprint with inferior products. So does this mean that Zwilling’s cookware can compete with top brands like All-Clad and Cuisinart? 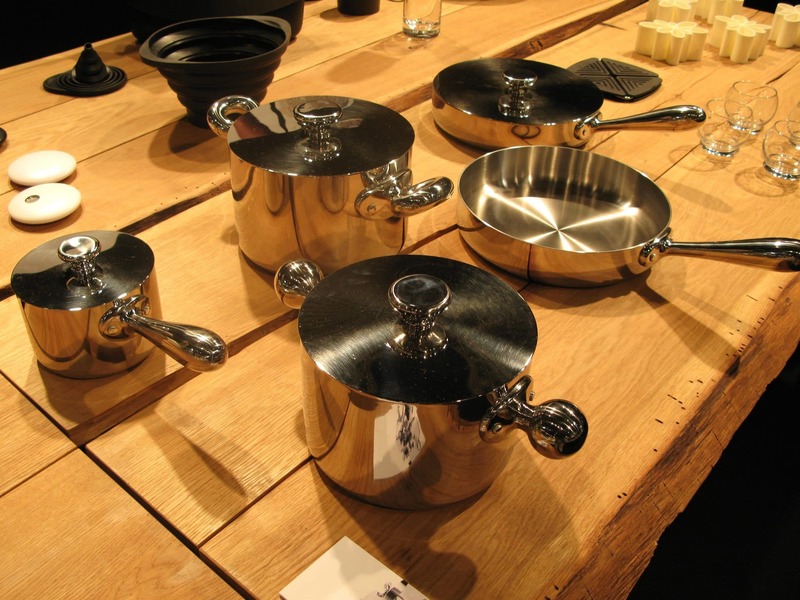 It's a perfect set for those of you who prefers durable stainless cookware. If you're looking for a nice non-stick set out there, consider this one from ZWILLING. If you prefer the more forgiving and even heat distribution, this set is made for you. If you’d like to give Zwilling’s cookware a try, I highly recommend to check out one this saute pan. If I had to pick a Zwilling cookware set to compete with All-Clad, this is the one I’d choose. This cookware set utilizes classic 3-ply construction to give you the heat distribution of aluminum with the durability of steel. While this cookware set can be a bit pricey, it’s still fairly inexpensive for a high-quality set from a top-end brand, especially given that this cookware will last virtually forever. How does Zwilling manage this feat of durability? 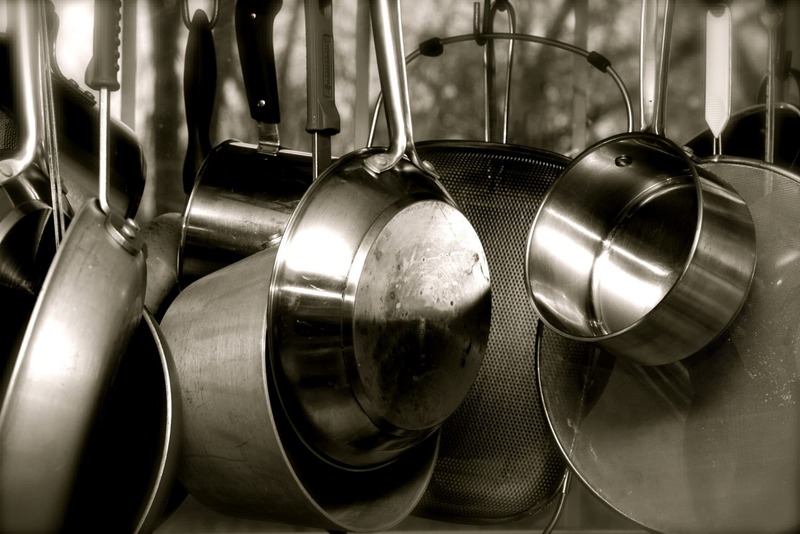 Simple: the cookware is made totally from metal. 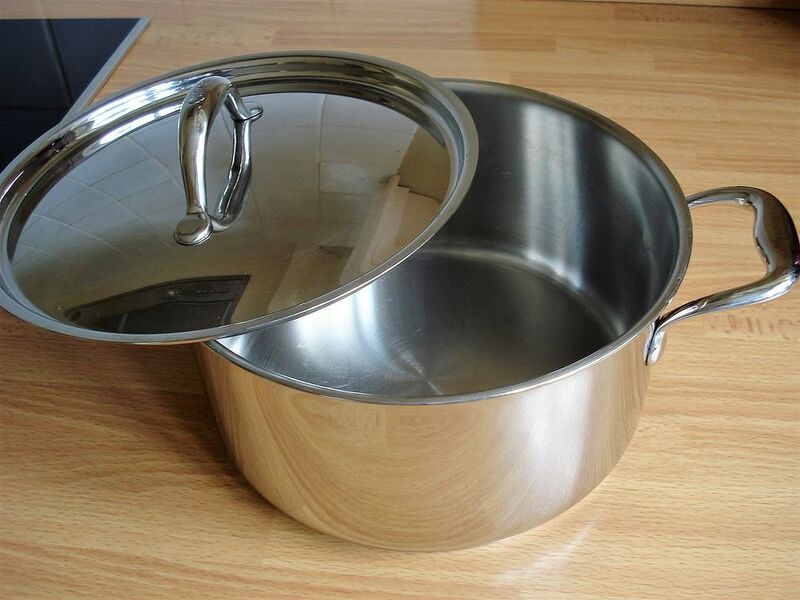 The exterior of each pot and pan is made from stainless steel, while the handles are also made from a durable steel alloy. The only thing that’s liable to chip or break are the handles, which are made from tempered glass. As long as you don’t drop them, however, they’ll hold up for years (and you can always buy new lids if you need to). I mentioned that this set was 3-ply. If you’re not familiar with the term, however, this might not mean a lot to you. 3-ply pots and pans are made with three layers of metal: a steel exterior, an aluminum core, and a stainless steel interior. The steel interior and exterior are easy to clean and won’t tarnish or rust. Additionally, the stainless cooking surface is safe to use with foods that might react to other metals (acids don’t mix well with copper, for example). While stainless steel helps your cookware last for a long time, aluminum lets it perform well on the stove. Steel is actually a fairly bad conductor of heat. This means that an all-steel pan takes a very long time to heat up and almost as long to cool down. Aluminum, however, conducts heat pretty well. By making the core of each pot and pan from aluminum, Zwilling ensures that the pots and pans in this collection will heat up quickly and evenly. It also helps keep weight down. Of course, these basic features are offered by tri-ply cookware made by a variety of brands, including kitchen staples like Cuisinart. Zwilling’s cookware compares very favorably to these other offerings. Customer reports seem to indicate that Zwilling’s pots and pans hold up exceptionally well with actual kitchen use, meaning that they may very well beat out other tri-ply options with construction quality alone. One important difference between Zwilling cookware and the competition is weight. The word “heft” gets thrown around a lot in cookware reviews. While this factor is totally subjective, there’s certainly a different feel between a heavy pot and a light pot. Zwilling’s cookware is on the heavy end, meaning that if you like “heft” you’ll definitely prefer it over something like Cuisinart. On the other hand, if you prefer lighter cookware, you might want to go with a different brand. The pots and pans themselves seem high quality and have a number of ease-of-use inclusions that help distinguish them from other cookware sets. The rims of each pot and pan are flared for drip-free pouring, while the handles are carefully designed to minimize heat transfer from a hot pot or pan. This won’t keep your hands totally safe when you move a stockpot that’s been simmering for hours, but it does mean you won’t need a potholder all of the time.The thing that either makes or breaks this cookware set is the price. I don’t like talking about price much due to how volatile online prices are, but it’s something that needs to be discussed here. At full price, this particular cookware set is beaten clean by the Cuisinart Multiclad Pro line, in my opinion. The redeeming factor here is that the Zwilling Spirit line is frequently on steep sale. When it’s heavily discounted it’s sometimes even cheaper than the Cuisinart set. Should you manage to snag it during one of these times I think it’s absolutely worth considering over other options. The combination of high-quality construction and smart design features makes this one of the better high-end multi-clad cookware sets on the market. While it’s slightly pricey at full list price, it’s often discounted, making it a fantastically cost-effective way to put a high-quality metal cookware set in your kitchen. While I’m a pretty big fan of the metal cookware set above, this ceramic non-stick set is less to my liking. It offers a fairly unique combination of features: tri-ply construction with ceramic non-stick is quite rare — but it doesn’t offer much that the set above doesn’t. It’s also quite pricey, which is a big downside as far as non-stick cookware sets go. This is because ceramic non-stick doesn’t last very long. 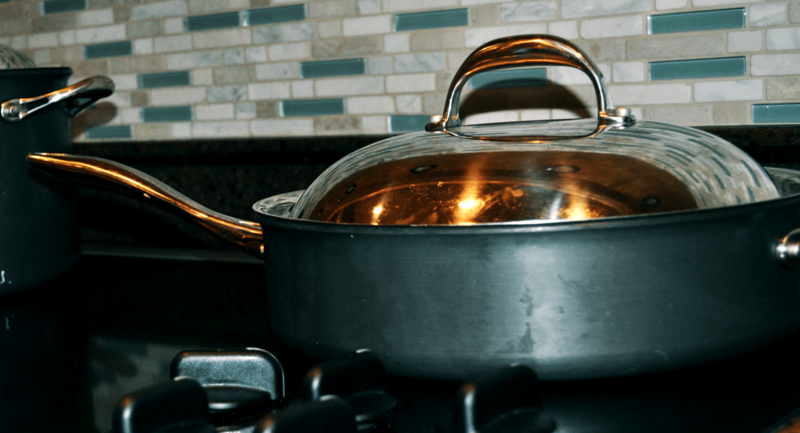 Sure, you’ll get several years of use out of your pots and pans under optimal conditions, but you’ll almost certainly replace your pots and pans well within a decade. While it’s easy to justify spending a few hundred dollars on a cookware set that will likely last you the rest of your life, it’s much harder to justify that level of price for something you’ll replace in three or four years. You also don’t really need the benefits that tri-ply construction normally offers. A stainless steel interior is rendered useless by a layer of ceramic coating on the interior, while the durable steel exterior matters a lot less if you’re going to throw away a cookware set in a couple years. In other words, the things that make this cookware set stand out among other non-stick sets aren’t particularly positive qualities. This is a shame. This cookware set features all of the same smart design decisions as the set with the metal interior above. In fact, other than the ceramic interior, it’s pretty much identical. If it was a bit less expensive, I’d love to advocate its purchase. As it stands, however, I think you’re better off choosing a less pricey non-stick cookware set over this Zwilling ceramic cookware. Before we continue, I’d like to briefly share what my research has revealed about the difference between two of Zwilling’s product lines. The only real differences are the exact style of the handles and the exterior finish. While Spirit features a brushed exterior, Energy is more polished and has a mirror finish. Both lines are otherwise practically identical. This 5-ply cookware set is quite similar to the Spirit line above. Key differences include metal lids (instead of glass ones) and the extra two layers of material used in the construction of this cookware. 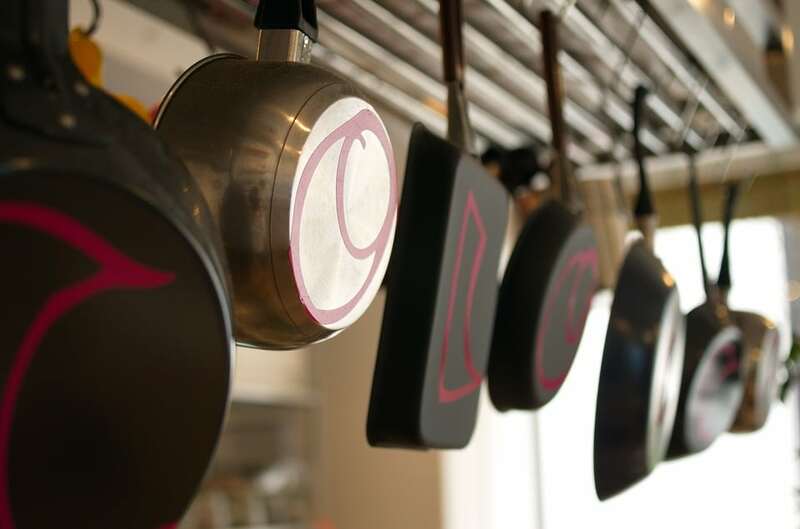 While tri-ply cookware uses a core of aluminum for fast heat distribution, some chefs prefer slowing down heat transfer to make sure the entire pan heats up evenly. In order to achieve this goal, cookware manufacturers put a layer of steel in the middle of the aluminum core of the pan. This means that heat will spread evenly throughout the bottom aluminum layer before penetrating the thin steel barrier and then proceeding through the rest of the pan. In practice, there isn’t a huge difference in between the performance of a tri-ply and a five-ply set of cookware. Advocates of 5-ply lines claim that they’re better for beginner chefs since the slightly slower and more even heat transfer means you’ve got more room for error with regards to your burner settings. I think that the higher cost of 5-ply cookware sets makes this argument hard to swallow, but I know plenty of experienced chefs that prefer their 5-ply pots and pans to the 3-ply alternatives. Like the Spirit line, this set feels high-quality and is packed with ease of use features. The handles are again designed to stay fairly cool, while the edges of the pots are easy to pour liquids out of. One extra feature that this set offers over the Spirit line is oven safety. Due to the metal lids, you can throw this cookware set into the oven at up to 500 F.
If you prefer the more forgiving and even heat distribution of a 5-ply cookware set, the Aurora collection might be right for you. While it’s pretty pricey, it’ll last virtually forever and is actually less expensive than some 5-ply sets from other brands like All-Clad. You’ll be able to appreciate this high-quality cookware for many, many years. Covered saute pans are one of my favorite pieces to recommend for people checking out new cookware collections. Not only do these make great pans for frying and sauteing, you can actually simmer liquids in them, making them perfect for one-dish recipes. If you want to cook a steak and make a pan sauce or brown meat and then simmer a stew, pans like these let you do everything without using more than one dish. While this is great for convenience, it’s extra great for trying out a high-end cookware line you’re not quite sold on. The ability to try multiple types of dishes and not just eggs or stews means you get a good feeling for how cooking a wide range of foods will go on a full set. This lets you make an educated buying decision when it comes to purchasing a more expensive set of multiple pots and pans. This covered saute pan is available both with a ceramic non-stick coating (Thermolon, even) and without. My personal preference for the whole set is definitely the stainless steel interior, but that changes somewhat when I’m purchasing individual pieces. I like having a new “egg” pan with a fresh non-stick that I can use when I want to turn my brain off in the kitchen. You get the same set of features when you get an individual pan as you do when you get a Spirit cookware set. This means you get the “stay-cool” steel handles, the well-fitting glass lid, and the rolled rim for easy pouring. Both versions of this pan are oven-safe to a pretty high temperature as long as you remove the lid, meaning that they’re even more versatile than you might expect. You also get the signature Zwilling “heft,” meaning that this pot can feel a bit heavy at times. Overall, however, this is one of my favorite single pieces of cookware on the market. It’s quite versatile and is very comparable to an All-Clad saute pan at a more reasonable price. If you’d like to give Zwilling’s cookware a try, I highly recommend that you check out one of these saute pans and give it a whirl. Zwilling Cookware: The All-Clad Killer? Zwilling’s numerous multi-ply cookware lines feature smart design decisions and high-quality construction. The brand compares very favorably to other high-end cookware manufacturers including All-Clad and Cuisinart and beats cheap store brands like Tools of the Trade clean. One thing to watch out for is their online pricing. If any of these products are heavily discounted, you’ll want to buy now — you never know how long the sale will last!